When we put Skrillex on SPIN’s 100 Greatest Guitarists of All Time, we didn’t realize he’d take it so seriously. Today he’s gathered up his EDM friends — Grimes, Diplo, Pretty Lights, Tokimonsta, and KOAN Sounds — and announced a remix of the iconic 1970 Canadian train tour taken by Janis Joplin, the Grateful Dead, and the Band, among others (we don’t, however, expect any collaborative “Friend of the Devil” remixes… or do we?). 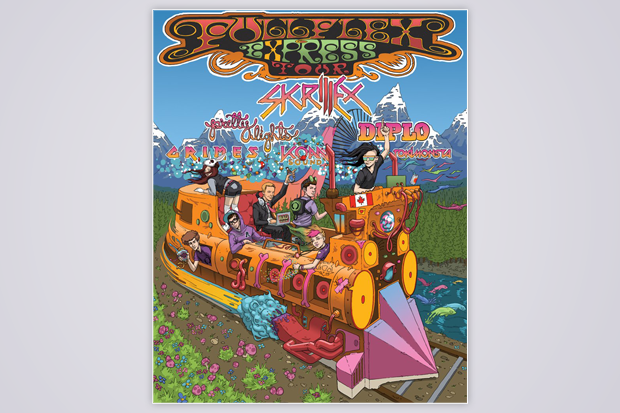 By the looks of the soon-to-be-Festival Express. No ticketing info on Full Flex has been released yet, but its official website has got some pretty suggestive countdown action going on that will probably shed some light on that soon. Though Skrillex is marked as the definitive headliner, it’s worth noting that the only artist on the tour who’s actually Canadian is the Vancouver-native Grimes, who will miss one stop on the tour to hit up Pitchfork Festival July 14 (Diplo, Skrillex, Pretty Lights, and Tokimonsta are all American, while KOAN Sounds is British). Then again, the White Stripes weren’t Canadian, either.